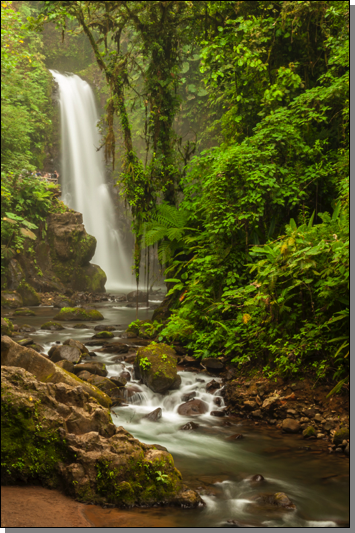 Your Costa Rican adventure begins today as you board your flight to San José, the country's capital city. We will stay overnight overlooking the sprawling mountains and volcanoes in the hills of Alto de las Palomas, about fifteen minutes away from San José. The hotel offers excellent accommodations and superb service in a suburban village setting. We will have a Welcome Dinner and Orientation. Before breakfast photograph in the beautiful grounds surrounding the hotel. 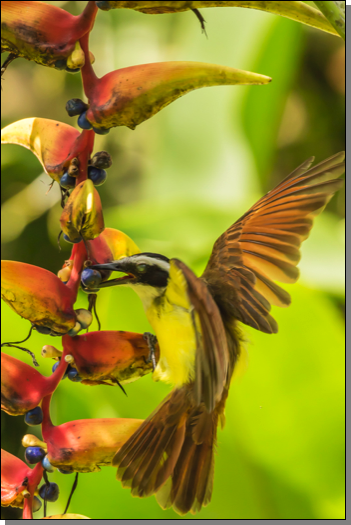 This will be your first opportunity to see tropical flowers, Blue-gray Tanagers and Bluecrowned Motmot are easy to photograph as they feed outside in the garden. Enroute to your next location visit the La Selva Biological Station where you will have the chance to appreciate the flora and fauna of this exotic place. La Selva is perhaps the longest running and, certainly, one of the most prestigious research stations on tropical rainforest anywhere in the world. 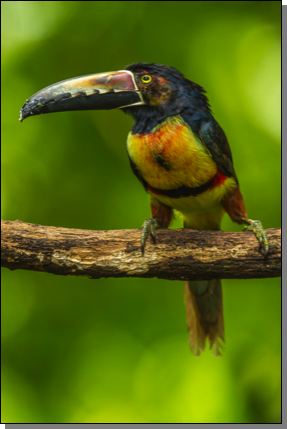 It forms part of a much larger protected area, which includes Braulio Carrillo National Park. The trails are very easy to negotiate, ranging from paved to hard-packed earth. After breakfast make your way to the Arenal Volcano Area. Along the way visit the Mirador de Quetzales, where you will have the chance for additional bird photography. Continue on to Arenal, a spectacular, cone-shaped volcano rising out of the flat San Carlos Plains. It is the most active volcano in the country. vistas of the Volcano from the hanging bridges over the forest make a perfect combination for an unforgettable experience. In the afternoon visit the Hidalgo Family Hot Springs, an exclusive retreat for those looking for a relaxing respite in natural springs heated by Arenal Volcano. Then make your way to Monteverde. To enter the cloud forest we travel by boat across Arenal Lake, with our coach and luggage meeting us on the other side. Monteverde, is located in the Tilaran Mountain Range. 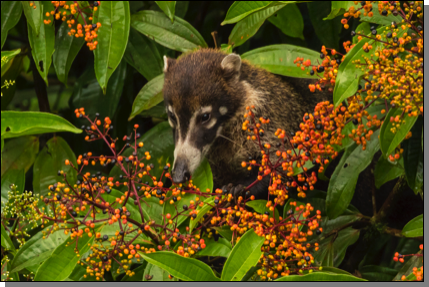 This famous reserve offers well-developed and easily negotiable trails and access one of the most beautiful cloud forest, anywhere. 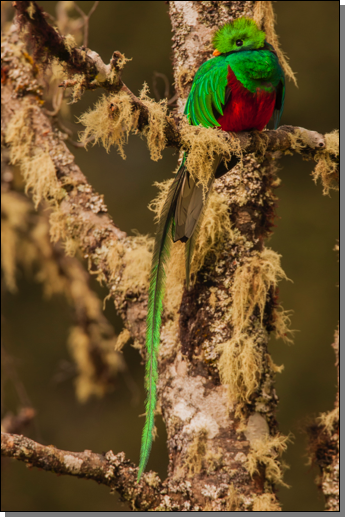 Famous for its populations of Resplendent Quetzal, Monteverde has almost become synonymous with this legendary bird. 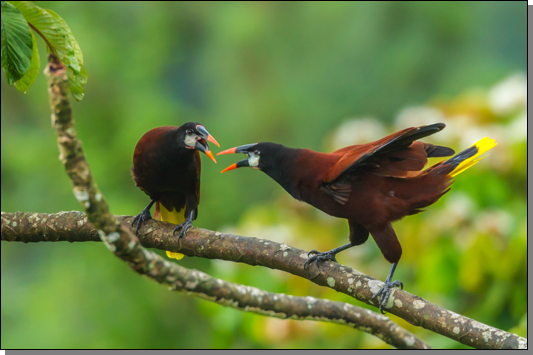 Visit the Curi-Cancha Reserve, a birdwatcher’s paradise. The Resplendent Quetzal, Three-Wattled Bellbird, Blue-Crowned Motmot, Orange-bellied Trogon, and many others are frequently seen. Frequently sighted mammals include armadillo, coati, agouti, kinkajou, ocelot, two-toed sloth, and three species of monkey: mantled howler, white-faced capuchin, and spider monkey. You will be able to photograph another day amidst the Monteverde Cloud Forest Reserve. The Sky Tram & Sky Trek is a series of suspension bridges spanning forested valleys in the cloud forest. Accessible to almost everyone it provides visitors a bird’s-eye view of this spectacular habitat. The tram travels up the mountain side to arrive at a wide observation platform at the highest point. At La Paz Waterfall Gardens, visitors have the unique opportunity to reach out and touch the impressive and mesmerizing cascades of five magnificent waterfalls flowing through rain and cloud forest. A series of observation decks built on the cliffs of the verdant canyon are perfect places to take memorable photos or simply sit back and feel the falls’ refreshing mist. 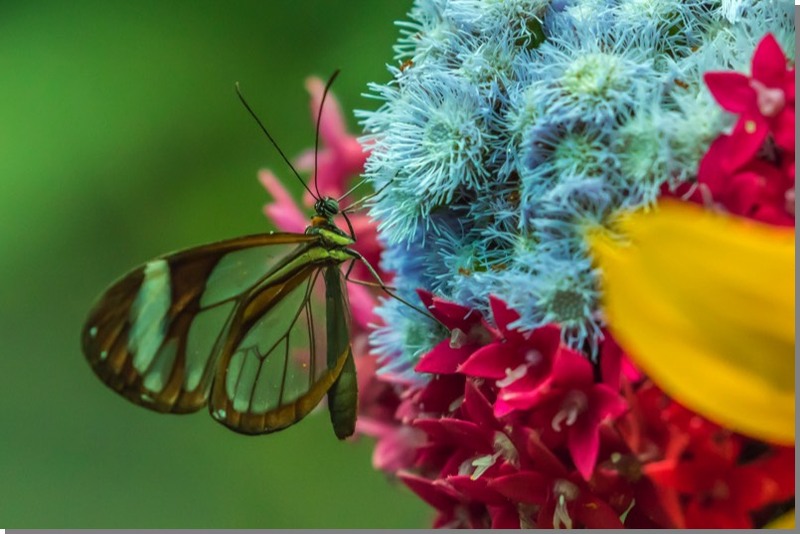 The park has beautifully maintained low-impact trails that wind through a large butterfly observatory, aviary, snake exhibit and colorful garden teeming with curious hummingbirds. The hummingbird garden and feeders attract several different species of birds we can photograph along with the beautiful orchids and flowers. A nearby frog house and reptile display offers opportunities to photograph red-eyed tree frog and several snakes that visitors rarely encounter in the wild. You will enjoy two evenings here to enjoy the surroundings of the Peace Lodge. The rooms are luxurious, designed to be reminiscent of the rainforest environment. Rustic wood details are featured throughout the decor and private balconies overlook a dreamy forest mingling with clouds. Guests stay comfortable with fireplaces, heaters and Jacuzzis featured throughout the premises, designed to evoke a sense of peace and tranquility.